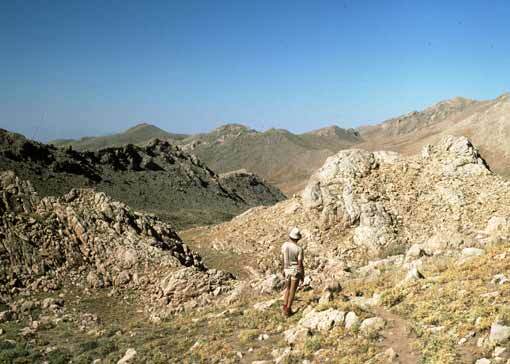 Photographs fron the 1977 British Speleological Expedition to the Zagros Mts, Iran. - Back to index - foward to next image - Andy Dawe gazes out over the top plateau. ...not a very good pic this - but I didn't get too nany of the top pateau. We were either too tired from caving, or even worse staggering around in 40 c looking for caves, or too ill, and really speaking it just all looked the same. Here is about 11,500ft at the ridges and 10.000 - 10,500ft the rest - and in area - about 9 miles wide by about 13 long - approx 7000ft higher than our base camp. We found virgin caves all over this area - you could go out with a few hundred feet of gear and take your pick of five or six - just be confident that you can abseil to the end of a rope and come back up again without reaching any floor ! The potential from here, to the risings at Palangan is 6,500ft plus - 2000ft over the present depth records - even now, twenty five years on.